The Juki line of sewing machines can be used to sew simple household items, to large amounts of apparel in a factory setting. As with any sewing machine, proper threading is essential in order for the machine to make strong, correct and even stitches. Although Juki sewing machines have many parts that the thread must pass through, it is important that the machine is threaded correctly to ensure its proper operation. Turn the hand wheel to the right so that the thread take-up is in the highest position. Pass the thread through the spool pin located on the top center of the Juki sewing machine. Pull the thread from the spool pin, and pass it through the three holes in the tension regulator at the front of the machine. Push the thread though the top hole and pass it through the middle and bottom hole. Pull the thread down and wrap it counterclockwise around the tension adjustment knob. Pull the thread up through the pin right above the knob, then pull the thread down and wrap it around the next pin located in front of the adjustment knob. Run the thread up into the main thread take-up. Pull the thread up and wrap it around the top screw, then push the thread down and slide it into the upper thread guide. Pull the thread down through the lower thread guide until you get to the needle. Pass the thread through the needle from left to right, and then pull the end of the thread through the feed dog to the back of the machine. Pull out at least 4 inches of thread. Your Juki sewing machine is now fully threaded. 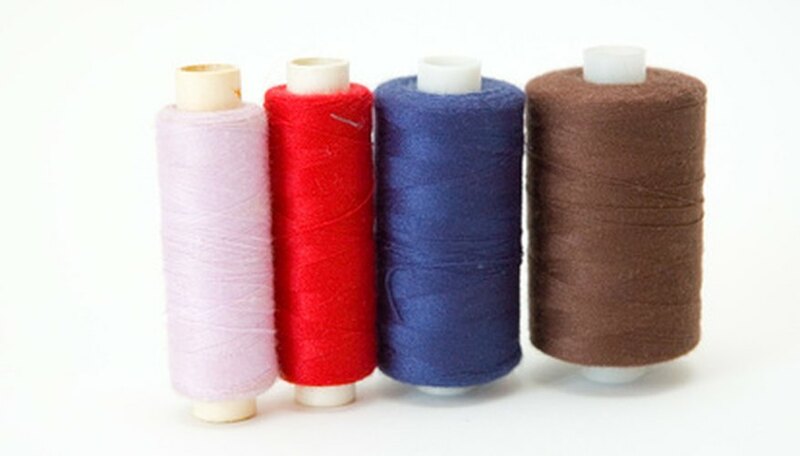 Always use good-quality thread whenever possible.